Making all kinds of popsicle is one summer activity I really enjoy doing with the kids. They love thinking up flavors and combinations, pouring the different fruit mixes into the molds and the part they love the most is unmolding the popsicles. The part they hate is waiting for the popsicles to solidify. To tell you the truth that is the part I hate the most too because depending on what mix is waiting for them in the freezer they can check on it anywhere from every half an hour to every couple of hours with the question:(Muuuuuuuuuuuuum is it done yet? ).These minty watermelon popsicles are my son’s favorite at the moment. They are really easy to make, super refreshing and nothing can quinch your thirst and cool you down like watermelons. You can flavor watermelon popsicles with a variety of flavors. You can use ready made syrups like pomegranate syrup or rose syrup or you can infuse your own simple syrup with your favorite flavors. Mint, cinnamon, orange peel all work beautifully with watermelon. Do I really have to buy those popsicle molds to make these? No you don’t. You can easily make these using plastic or paper cups. Fill them then cover the tops with plastic wrap and poke a popsicle stick through the plastic wrap in the center of the cup, the plastic wrap will hold the stick in place. Before we get to the recipe, tell me my dear reader, have you ever made a popsicle at home? what is your favorite flavor? Posted in Granita and cold treats and tagged fruit popsicle, minty watermelon, popsicle, summer. Bookmark the permalink. I resisted so far, but you are making it a tough battle to fight…. Thank you for your kind wish for successful popsicles. I made them last year using the first batch of mango-ginger sherbet I created. I was hoping for a two toned popsicle but never got that far. 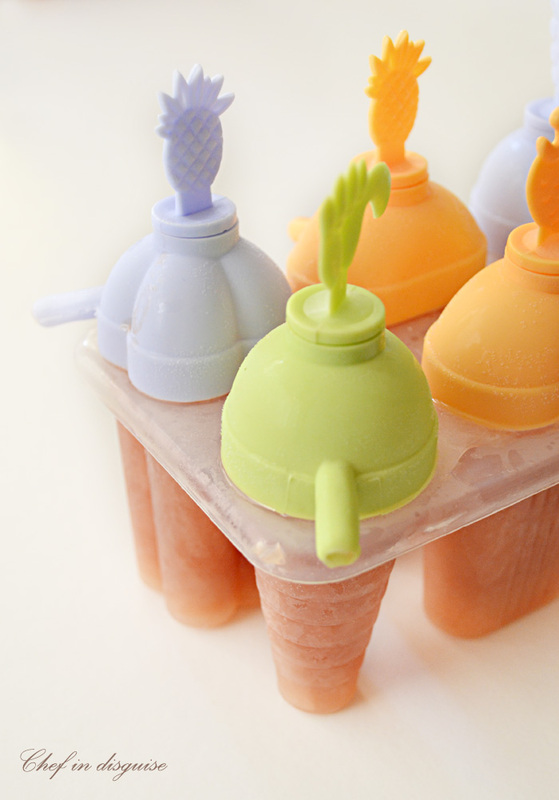 We love making popsicles around here – the boys currently love our yogurt ones, but these look so fruity and tasty! I think we need to try them. And as for the handles, they are perfectly cute with it! I just bought some popsicle molds and have been dying to use them. My plan was to use fresh cherries as a component, but haven’t gotten to it yet. Your minty watermelon looks delicious and delightful…just right to cool off with on a hot day! I do have some molds (good old Ikea) but only rememebr to use them when I have little people in the house…I really should use them more as I love lollies/popsicles. These sound fantastic and I adore watermelon so I know I would enjoy them. My favourite last year were mango made with a mix of pulped mango and mango nectar…mmmm! oooh mango sounds so good! PERFECT for this horrific heat! I love the idea of mint and watermelon. Well, I won’t be buying popsicle holders anytime soon, but I could just freeze the mix. Looks awesome. Those pops look refreshing and very pretty. I love the combination of watermelon and mint because it add a little distinct after taste there. Look at that sweet little hand! 🙂 And I love, love, love the chopstick idea!!!! That’s genius! 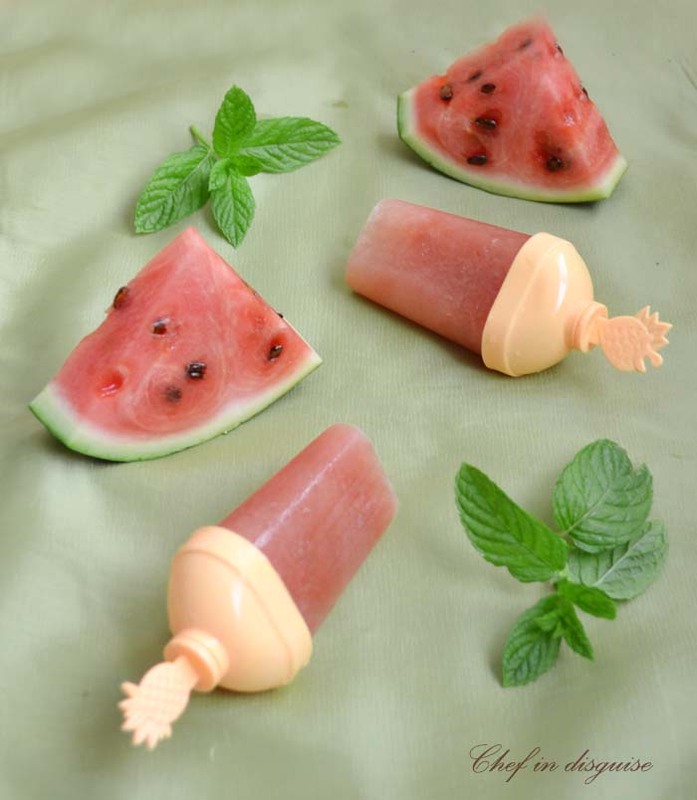 And I love the use of watermelon for popsicles. Mmm! Love your molds. Yes, I have used the paper cups but the molds are so much more cooler and so much more fun. What a great combination of flavours, Sawsan. My Mom used to make us orange Popsicles which were my favourite, she just poured juice from concentrate into the forms and froze. I loved sucking the juice out of them! Oh and then there were the chocolate pudding pops that were amazing too! What a lovely healthy summer treat. Chocolate pudding pops..wow! that sounds amazing! do you have a recipe for it Eva? Hi Sawsan, I seem to recall my Mom just made chocolate pudding (from scratch) and froze it in the Popsicle shapes. I may try a rendition of it for an adult desert on the weekend, as we are invited for brunch to my BFs house! Fun post. Someone recently gave me some popsicle molds, and I have yet to use them. It’s prime watermelon season where I live (St. Louis), and local watermelons are in the store. Plus I have more mint growing in my garden than I know what to do with. Think it’s fate? Think I should make this? 😉 Nice recipe, nice blog. I found you through your interview with Maureen – fun interview! I’ll be back. I think these would even get my teens acting like little kids again! Can’t wait to try. We’ve had an overflow of watermelon lately as I’ve been making Watermelon Rind Pickles. This is perfect! Thanks! Great little popsicles! Love the use of mint with watermelon – great combination! 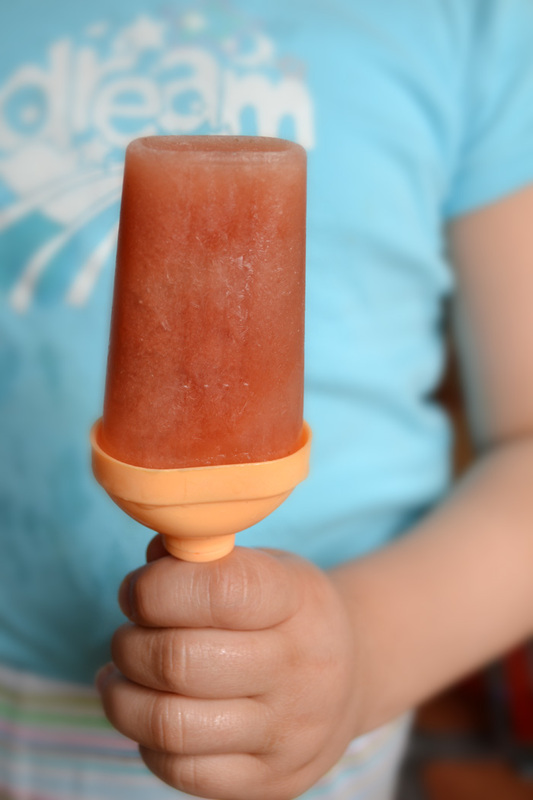 I appreciate the ideas on how to make popsicles without molds! I have the cups and tons of disposable chopsticks. Looks like I’ll be making these soon! These look amazing! I can’t wait for summer… mmmmm. One of my favorite summer dessert recipes is watermelon granita, but this one is another tasty idea for watermelon!! Rose water and mint definitely enhances the taste of the popsicle! These look just delicious. Pops are one of my favorite desserts during hot weather. These look amazing!! And the pictures are great too!!! Your post made me smile because we’re totally opposite. I’ve been making ice cream/sorbet using the ice cream maker but I haven’t started making Popsicle yet. I’ve been telling myself to do it, but my ice cream maker bowl in the freezer is calling me (and they take up some space, so if I am not using it, it’s such a waste of space), and I don’t have space for Popsicle yet.. LOL. But I need to join this Popsicle bandwagon soon. And for sure I’ll have to start with Popsicle next summer. I’m saving your delicious recipe! Refreshing and delicious! Perfect when it’s steaming hot outside. The popsicles molds are so cute. The watermelon popsicles must taste great. One of our family’s favorite desserts especially in the summer. These look so refreshing and yummy!